A couple months ago, Lourdes, the campus minister of the Catholic Community at Stanford contacted our community and asked we had any needs or projects they could help us with. They applied for a grant to fund the major project of the day - a much-needed greenhouse for protecting young seedlings and plants started by our gardening sisters. 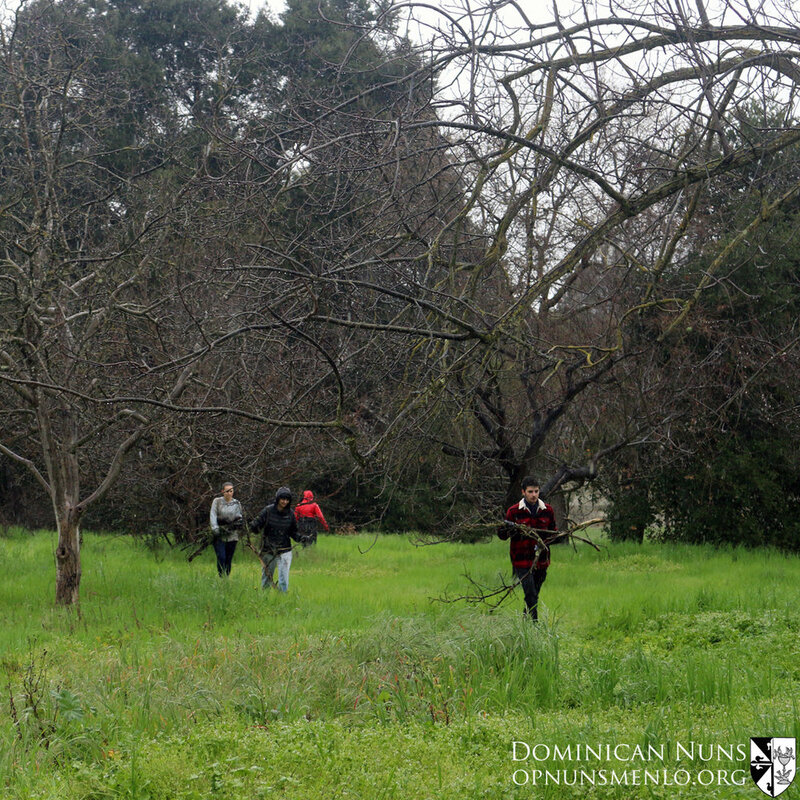 While Sister Amata Marie and one group of students set to work building the greenhouse, another group headed to the orchard and fields for some “heavy lifting” - helping Sister Mary Francis clear away branches, trimming and debris hazards for the tractor to run later in the season. Finally, a third group went with Sister Andre Marie to tackle the grass and weeds in our “Mary Garden”, a garden renovation project-in-progress. The Stanford students also donated a shrine pillar and pledged a protective covering for the Our Lady of Lavang Shrine, which will be part of this garden. After a good morning of work in the pouring rain (which seemed to stop just as the bell rang for Midday Prayer), the students and sisters dried up enough to go the chapel and choir for Midday Prayer and the Rosary. After the midday meal, we met once again in the parlor for some questions, answers and good conversation. A big thank you to Lourdes and the Stanford students! Deo gratias! The greenhouse team. Sister is holding the umbrella not so much for our volunteers as for the instruction book! The rain was causing the pages to stick together and disintegrate when they tried to turn them! The field and orchard team. They were so into their work - breaking down and clearing away as many limbs and branches as possible - they even turned down a coffee/tea/hot chocolate break! The Mary Garden team did an amazing job clearing away weeds from the existing flower beds and from the ground marked out for future paths, especially with as muddy as the ground was from our week-long rain. The finished greenhouse! 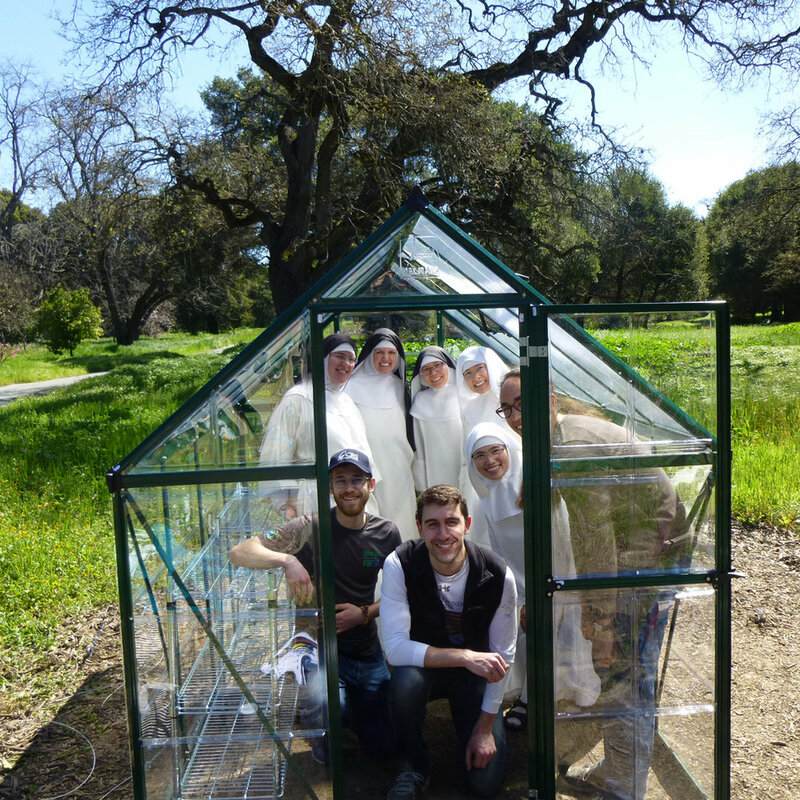 Because of the weather and building conditions, some of the students on the greenhouse team volunteered to return on a following Saturday to complete the project. Thank you!